I am extremely proud to announce that I have joined the staff of Severe Weather Australia (SWA) as their Tasmanian Chief of Staff. I have been a enthusiastic supporter of SWA National News Director, Daniel Shaw, for a number of years, in awe of his annual USA Storm Chases. When he started SWA in 2016, Tasmania was the only state lacking any registered storm chasers and in 2018 I become the first registered SWA chaser in Tasmania. Fast forward to January 15 and Tasmania experienced a dry lightning event, with a fast moving storm passing over Hobart. I was lucky enough to capture the above photo from near my home as this storm was moving too fast to chase. 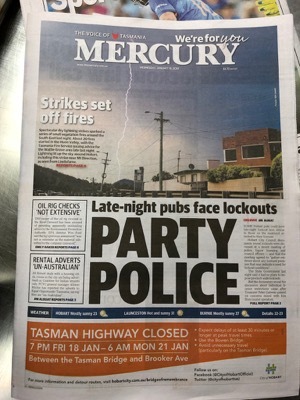 Promptly submitting the photo to SWA and Daniel’s fast work, as the photo was successfully licensed to the Mercury as the front page picture the next day. During the course the the evening conversations with Daniel while the licensing details were sorted out, Daniel very generously offered me a position as Tasmanian COS, which I very gratefully accepted. As a result of these, you can expect to hear more about Severe Weather Australia on my blog, along with more posts about storm chasing I am actually doing. If you are a Tasmanian photographer with an interest in producing severe weather (Fire, Flood, Storm, Aurora) content that you may wish to license, please feel free to get in contact with me.